When searching for a Retroclone to play, it’s impossible to not read about Labyrinth Lord. 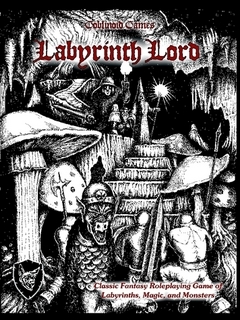 Written by Dan Proctor of Goblinoid Games, Labyrinth Lord is a clone of Dungeons and Dragons Basic and Expert rulebooks. It’s part of the “first-wave” of retroclones to come out, and has had one major revision since its release (primarily new artwork). Goblinoid Games knows how to make a nice-looking game, there’s no doubt about it. While the initial release had a more “amateur-looking” cover and artwork, the revised edition, with all art by Steve Zeiser, has a nice uniform look. The font is very easy on the eyes, and each section is clearly marked. Of all the retroclones, Labyrinth Lord may be the best as far as looks. But to counter that heap of praise, there is something about Labyrinth Lord that I can’t quite pinpoint. As one forum poster noted, reading Labyrinth Lord left him “cold”. At first I had trouble seeing it that way, but after going back to review the book I can now. I’m not sure if it’s the abundance of blacks/darks in the artwork, very little shading, etc. Or perhaps it’s the nice if straight-forward and no-nonsense writing. This is a book that wastes no time; here’s the game, here’s the set of rules, go play! Compared to the gushing enthusiasm of Swords and Wizardry or even the slight smile from Basic Fantasy, Labyrinth Lord is the straight-faced lecture. As a Basic/Expert clone, Labyrinth Lord has a solid foundation to build on, while refusing any “wishy-washy” feeling of Swords and Wizardry, or the march of progression of Basic Fantasy. Labyrinth Lord sticks to the guns of Moldvay, Marsh and Cook, and does little to sway from it. Again, it’s a great ruleset and those who aren’t looking for anything different from a “true clone” will be happy to go with Labyrinth Lord and never look back.